Our series on inter-city games involving Philadelphia area teams and St. Louis teams in the 1910s continues. 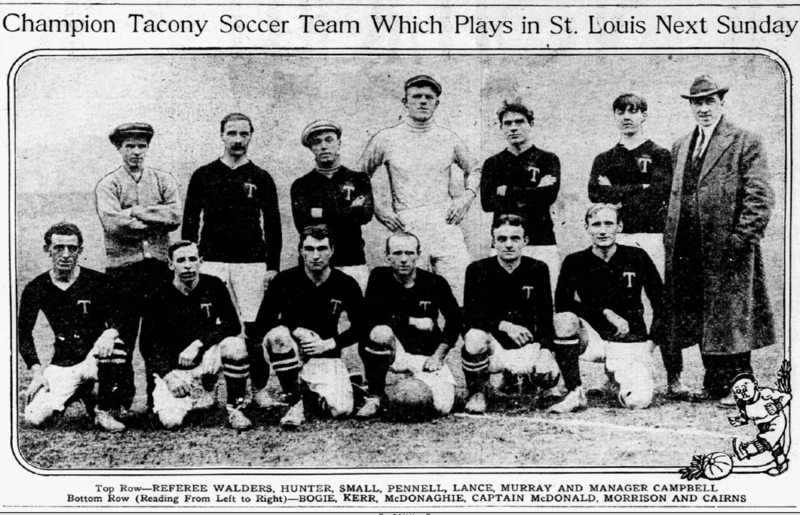 When Tacony FC traveled to St. Louis in December of 1911 in one of the first tours pitting the largely immigrant-based East Coast teams against the largely native-born teams from the West, they had lost only three games in two years. The confidence they felt on departure proved to be premature and Tacony returned to Philadelphia with a 4–4 draw against St. Leo’s in the “soccer championship of America” on Christmas Eve, and a 3-1 loss to Innisfails on Christmas day. Many factors—fatigue from the long train journey to St. Louis, playing on the road, the back-to-back match schedule—contributed to Tacony’s disappointing performance. But the prime reason was surely the fact nearly half of the players Tacony took with them on the brief tour were not actually on the team’s regular roster. Tacony was a “professional” team—its players shared in gate receipts—but the players did not make their living from playing soccer and five of its regular starters could not get permission to leave work to make the trip. Tacony would soon have an opportunity to gain their revenge, however. Shortly after they returned to Philadelphia, it was announced that St. Leo’s would be embarking on an East Coast tour in March of 1912. The Christmas holiday had allowed Tacony to make the trip to St. Louis. Christmas and New Year’s Day had long been occasions in Philadelphia soccer for exhibition games and, as two-time champions of the city’s professional Pennsylvania League and holders of the 1910 American Cup championship, Tacony were naturally an in-demand draw. After arriving back in Philadelphia on December 27, Tacony were first scheduled to face Philadelphia Celtic in league play on December 30. What should have been an opportunity to erase the memory of the loss to Innisfails instead turned into more cause for disappointment. Playing at Fairhill Ballpark at Third Street and Lehigh Avenue in Philadelphia’s Frankford neighborhood, Tacony conceded ten minutes after the kickoff. The Philadelphia Inquirer reported on December 31 that Celtic “adopted the kick and rush style of game, and Tacony was kept on the jump,” smart enough tactics when meeting a team that was playing its third game in a week that also included two days of continuous rail travel. The Inquirer reported that Tacony nevertheless played the better game and “was valued for four or five goals.” But the equalizer would not come; Tacony captain Hector McDonald even missed a penalty kick. It was Tacony’s first loss in league play after eight straight wins. The next day the Inquirer reported that St. Leos would be traveling East in March for a series of games. Tacony would be their first opponent. As was so often the case with the competition schedule during winter up and down the mid-Atlantic coast, bad weather caused the postponement of league play in Philadelphia until January 20 when Tacony bounced back with a 4–2 win over Gloucester Hibernian at Tacony Ballpark at State Road and Unruh Street. The Inquirer reported on January 21, “the League champions were about as the score indicates, two goals better than their opponents.” The win saw Tacony in first place in the league with 18 points from 9 wins (wins resulted in two points at the time), two points over Victor and four points above Hibernian. In view of their recent slip in form, Tacony had maneuvered to strengthen their roster, acquiring two players from the West Husdons of Harrison, New Jersey, one of whom was future Hall of Famer Robert Millar. Millar came to the US after playing for St. Mirren in Scotland. He would go on to have a long career in the US that would include time with Philadelphia Hibernian, winning the first National Challenge Cup with Brooklyn Field Club, winning the National Challenge Cup title in 1915 and 1919 with Bethlehem Steel FC, and winning the cup title again in his final year as a player in 1928 with New York Nationals, as well as coaching the US national team to the semifinals of the 1930 World Cup. The Inquirer reported on January 29 the transfer of the two West Hudson players to Tacony had occurred over the objections of Philadelphia Hibernian, which was understandable considering the two Philadelphia teams were due to face one another in only a few days time. The objections became more understandable when, in what the Inquirer referred to in its February 4 match report as “one of the prettiest plays imaginable,” Millar back-heeled a pass to McDonald to put Tacony up 1–0 only six minutes into the match. Ten minutes from time, Tommy Swords equalized for Hibs after receiving “a corking centre from the right wing” to keep their championship hopes alive. Tacony next defeated Wissinoming 3–0 in league play on February 17, then topped Gloucester Hibernians 4–1 on February 24 in an exhibition game. But, Philadelphia Hibernian, having played one more game than Tacony, moved into first place in the Pennsylvania League for the first time in the season with a two point lead. St. Leo’s arrived by train in Washington DC from St. Louis on March 14 after a brief stop in Cincinnati, the Cincinnati Enquirer reporting on March 15 that the traveling party was 21 people strong. After seeing the sights in the nation’s capital and resting there overnight the party traveled to Philadelphia the next day. St. Leo’s had a tough schedule ahead of them. Beginning with a match against Tacony on Saturday, March 16, they would play West Hudsons in Newark the next day. After a few days of rest and travel, they would play Howard & Bullough, the current holders of the American Cup and the title of “champions of the East” at New York’s American League Park on Wednesday, March 20. On Saturday, March 23, St. Leo’s would face Fall River Rovers before finishing their tour against the All-Nationals, a picked team of players from the National Association Football League (NAFBL), which was made up of teams from Northern New Jersey/New York City, on Sunday, March 24. St. Leo’s came to the East Coast as the “champions of the Middle West” after finishing ahead of Innisfails for their fifth consecutive St. Louis League title and then defeating Amateur League champions St. Marks on March 11 in St. Louis’ Murray Cup final to claim the city championship. They did so wearing new boots. St Leos. From the Spalding Official Soccer Football Guide 1912. Brannigan would have his revenge five minutes into the second half when he scored his 24th goal of the season to make it 2-0. “Tacony soon realized they were in for a beating unless they began to show some of their true form,” reported the Inquirer. They quickly got a goal back when center halfback Clark, who had joined the team from the West Hudsons, headed in a cross from outside right Plant. Despite several more chances, Tacony couldn’t find the back of the net and the match ended in a 2–1 victory for the St. Louis team. Time and again the front liners would work the ball down to their opponents’ citadel, but the final shot generally went wrong, the shooter booting the ball high over the bar or else wide of the mark. There is no denying the fact that the Pennsylvania League champions have never before this season given such a crude display in front of goal. The two elevens met in an alleged attempt to settle the soccer supremacy of the United States, but if the Westerners have not been in the habit of meeting very much weaker sides than their opponents of today, they will have to show greatly improved form if they mean to clash with the crack teams of the East…For the St. Leos the result was worse than defeat, it was an annihilation and their experience of today will probably teach them that to win a soccer game it is necessary to do more than cut a lot of fancy and needless capers in midfield. St. Leo’s next managed a 1–1 draw against Fall River Rovers. The Pawtucket Evening Times reported on March 25 the St. Louis team should have won as they had outplayed the Fall River team, “who were really an all-star team of Rover, Oak and Fore River players,” and whose single tally came from a St. Leo’s own-goal. If, as the Evening Times report suggests, the St. Louis team was “seriously bothered” by the heavy field conditions in their match against the Rovers, the conditions the next day against the NAFBL all-star team the All-Nationals at a muddy Olympic Park in Patterson were even worse. The Evening Times reported that the game “took place in a snowstorm which later turned into a torrent of rain” and that the “western cracks seemed lost.” In contrast, the All-Nationals, the Inquirer reported on March 25, “proved themselves to be good ‘mudhorses. '” In the end, St. Leo’s lost the game 4–2 to return home with a 1–3–1 record. Still, the tour had been a disappointment for the St. Louis team. Not only had St. Leo’s performed poorly, low attendance at some of the games — the Inquirer described the turnout for the midweek game against Howard & Bullough as “one of the smallest crowds that have ever witnessed a game of this class in this district,” and poor weather affected the gate for the Fall River and All-Nationals games — meant that the tour lost money. [F]or the first time in the history of the St. Leo Foot Ball Club a serious mistake was made by the management in arranging to travel some 2,000 miles, seeing the sights of the large eastern cities, accepting numerous social invitations in honor of the club’s visit East, and playing five of the strongest soccer aggregations in the East all within seven days time. As might be expected, the champions failed to show to their best advantage It was asking entirely too much of any aggregation to perform at their best under such conditions. Chicago players watched with interest the tour of the St. Leo team of St. Louis through the East. 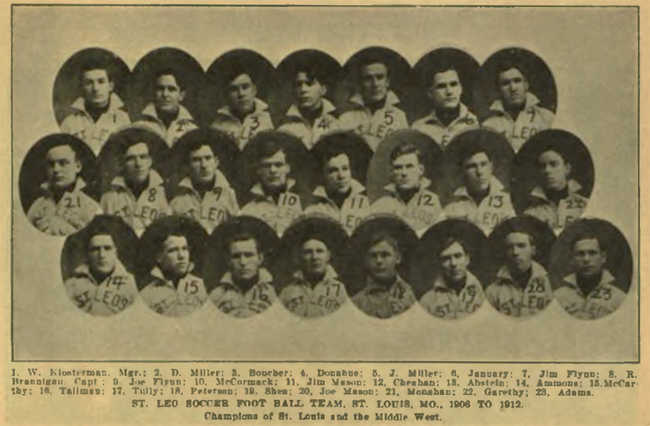 The St. Leos have won the St. Louis championship a number of years in succession, and by virtue if defeating Chicago teams, during the Christmas and New Year’s holidays, claim the championship of the Middle West. Chicago Players always have disputed this claim, as they generally have met the St. Louis teams after the Chicago season has closed several weeks. So far the St. Leo eleven never has met a Crack Chicago team in Chicago. Back in Philadelphia, with the defeat to St. Leo’s behind them, Tacony’s attention returned to winning their third consecutive Pennsylvania League title. They were aided in this when Philadelphia Thistle forfeited on March 30 after they traveled to Tacony shorthanded. On April 6, Tacony defeated Tennyson 3–1 in a rough match at Washington Park at 26th Street and Allegheny Avenue in which one Tacony player was cautioned, and another ejected, for striking Tennyson players on two separate occasions. Tacony secured the Pennsylvania League championship on April 13 when they defeated Trenton Caledonians 1–0 in Trenton, finishing out the 1911-1912 season on April 20 with a 2–0 win over Victor at Tacony Ballpark. Tacony would get a chance to avenge their poor showing against St. Louis teams when Innisfails would embark on an East Coast tour of their own in March, 1913. A version of this article first appeared at the Philly Soccer Page on February 23, 2012.